94000 Series Laminate Desks From Hon Combines 18th Century Design With 21st Century Performance. This 72"W Double Pedestal Credenza With Doors Can Be Used Alone, Or Paired With A Double Pedestal Desk And Stack-On Hutch To Create An Executive Workstation. Laminate Color Is Mahogany..
94000 Series Laminate Desks From Hon Combines 18th Century Design With 21st Century Performance. 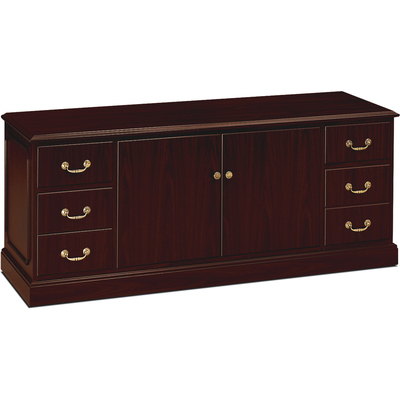 This 72"W Double Pedestal Credenza With Doors Can Be Used Alone, Or Paired With A Double Pedestal Desk And Stack-On Hutch To Create An Executive Workstation. Laminate Color Is Mahogany.